Put the lentils in a strainer and pick through them, discarding any bits of stone that might have escaped the packers; rinse under cold running water. Turn the lentils into a medium saucepan, cover them with cold water, bring to a boil, and cook for 2 minutes; spill the lentils out into the strainer. Drain, rinse the lentils again, and rinse out the saucepan. Press the clove into the onion and toss the onion, carrot, celery, garlic, and bay leaf into the pan. Pour in the broth or water, stir in the lentils, and bring to a boil. 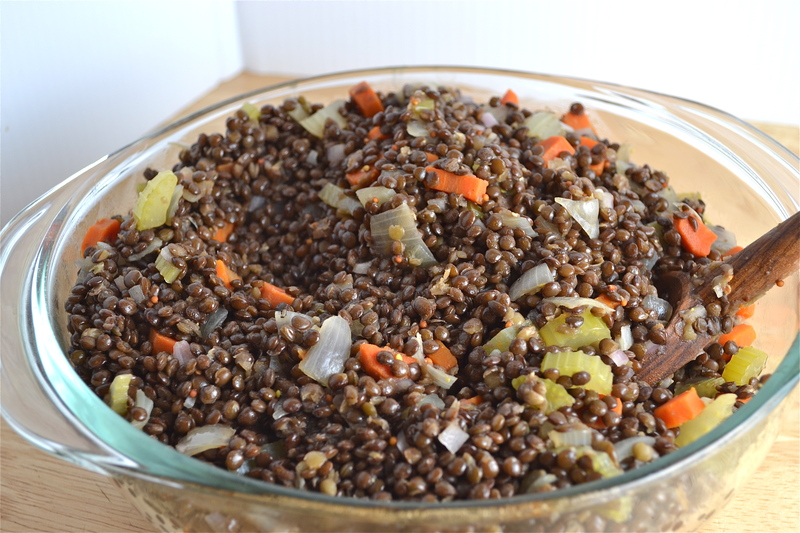 Lower the heat to a steady simmer and cook for 25 to 30 minutes, or until the lentils are almost tender. As the lentils cook, skim off the solids that rise to the top and stir as needed. Season with salt and pepper and cook until they’re tender, another 5 to 10 minutes, then pour in the Cognac, if you’re using it. Give everything a good stir and another minute over the heat. Meanwhile, whisk together all the ingredients for the vinaigrette – set aside. Drain the lentils, reserving the cooking liquid if you’re going to want to reheat them. Remove the vegetables and either discard them all or discard the clove and bay leaf and finely chop the vegetables, which will be soft but tasty. Stir the vegetables back into the lentils. Add the shallot, along with the vinaigrette (if using). The lentils are ready to be served now, or set aside and reheated over low heat in the liquid you’ve reserved. Storing: Once cooled, the lentils and their liquid can be packed airtight and kept chilled for up to 3 days. Warm in a covered saucepan over gentle heat. I just made this for my family in Colorado, everyone loved it! I was cooking for my brother and his fiancee, who are vegan, so I ended up using apple cider vinegar instead of wine vinegar. So yummy. Awesome! This is definitely one of my favorites – glad to hear it was hit with the fam!